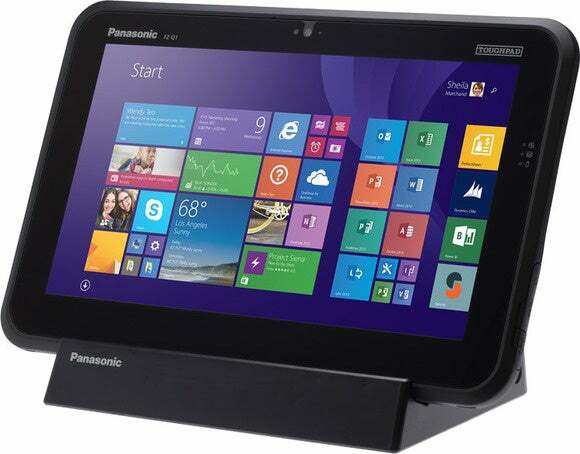 At CES, Panasonic debuted two new 12.5-inch Toughpad Windows tablets, dubbed FZ-Q1, that bring performance of the ultra-rugged devices up to the Haswell generation. Panasonic’s Toughpad launch happened during a Consumer Electronics Show press conference that was notably light on consumer products, at least until the tail end of the presentation. Panasonic announced a smart home system, dubbed Ora, as well as a few 4K televisions and displays. Of particular interest to PC owners, however, likely will be the new Toughpads, Windows tablets designed to withstand spills and drops and other forms of manhandling. Unfortunately, they’re running Windows 8.1. Of course, they can be easily upgraded to Windows 10—or not; the Toughpad market tends to appreciate older, stabler operating systems, and Panasonic even has a Windows 7 option available. The Toughpads are available in two versions: a $1,699 Performance model and the $999 Standard model. Both include a 12.5-inch, 1920-by-1080 display. Inside the Performance model is a Core i5-4302Y “Haswell” chip, 8 GB of RAM, and a 256 GB SSD, and the Standard model includes a N2807 Celeron processor, 4 GB of RAM, and either a 64 GB MMC or 128 GB SSD. Naturally, the Toughpads weigh a bit more than the average tablet: 2.3 pounds, and measure 13.4-by-8.7-by-0.8 inches. The tablets include 802.11ac Wi-Fi, Bluetooth 4.0, USB 3.0, and micro SDXC cards. Options include 4G LTE with satellite GPS and smartcard readers.